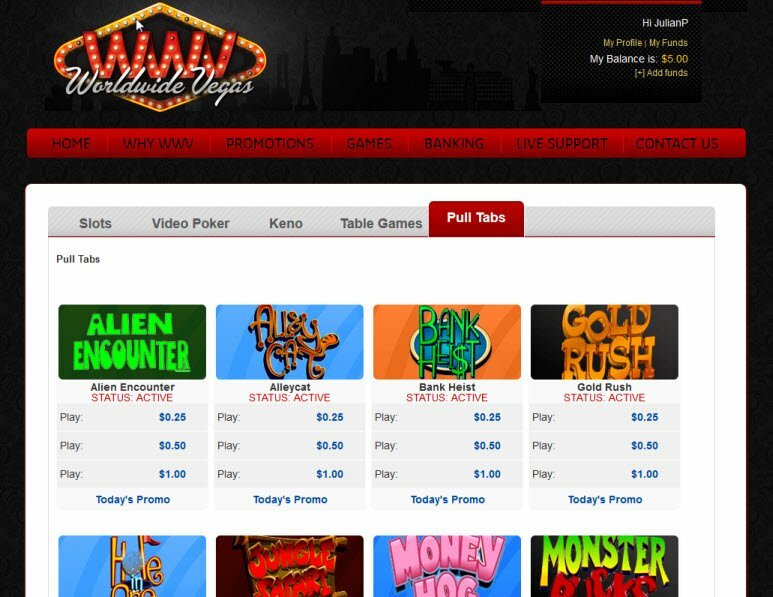 World Wide Vegas Casino is no longer available . Click here for alternative casinos . Whether you’re looking to try your luck at a few hands of Blackjack or want to hit the slots, World Wide Vegas Casino has got a great selection of online casino games. Choose from among Roulette, Blackjack, Slots, Craps, Keno, and Poker games available for streaming directly on their website, with no download required. World Wide Vegas Casino contains a database of over 200 online casino games. Play Slot and Video Poker Tournaments, spin the Roulette wheel, or win real money playing Blackjack. The casino has been around since 1998, and uses Java and Flash software. As soon as I signed up, my balance on the casino amounted to $5.00. This way I could place a few bets even before depositing my own money. In addition, World Wide Vegas Casino offers a $500 Sign-Up Bonus. What this means is that newcomers receive a 100% Match Bonus on first deposits of $25 to $500. These days I don’t even know why online casinos still require software download. Casino players really want the quickest, most convenient way of accessing online casino games. 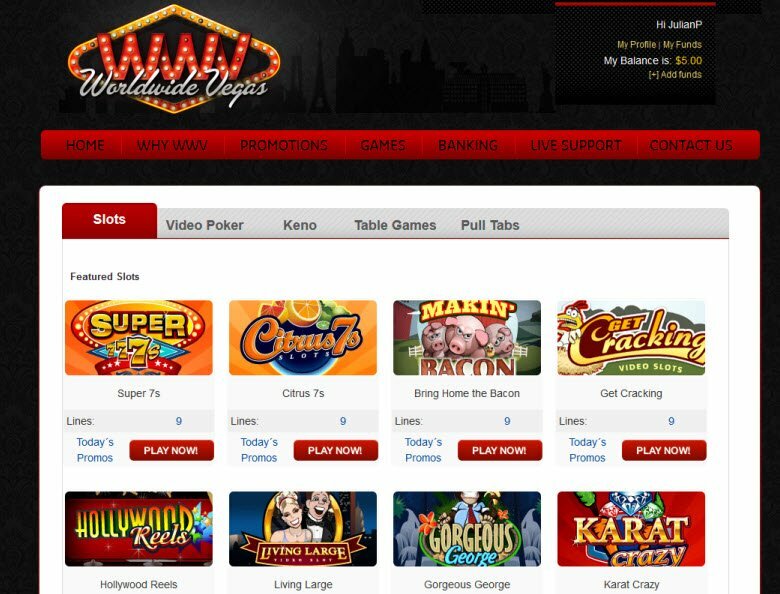 World Wide Vegas Casino offers a Flash Casino that streams directly from their website, with no download required. Choose from over 200 World Wide Vegas Casino games including Craps, Keno, Roulette, Slots, Blackjack, and Video Poker. 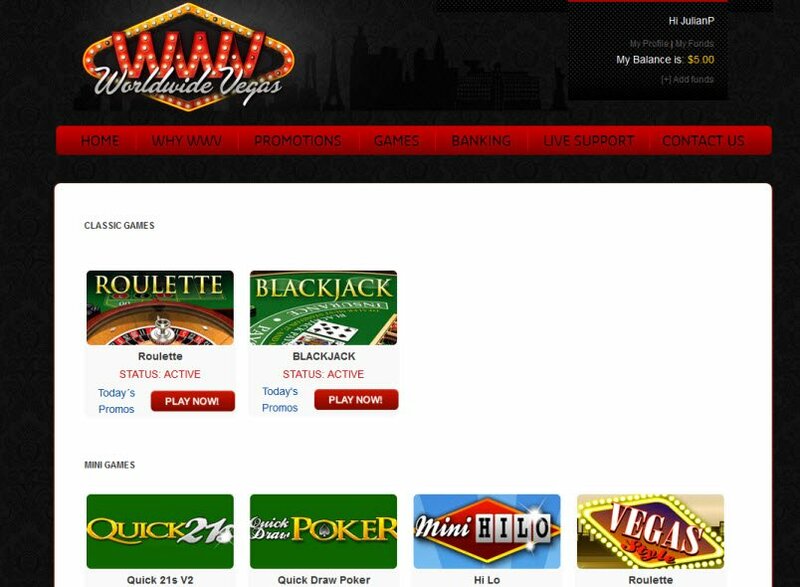 World Wide Casino offers tournaments on some of the games in which top ranking players receive cash prizes. World Wide Vegas Casino ensures that not only new players receive the benefits of playing with their casino… the casino hosts slot and video poker tournaments, 50% Cash Back Fridays, a Platinum Players Club, VIP Member Club, and more! World Wide Vegas Casino claims to offer a $500 Sign-Up Bonus. Technically, this is completely true. However, in reality, players receive a 100% Match Bonus on first deposits of $25 to $500. Therefore, only players who deposit $500 initially receive the full $500 match. Many online casinos lure new players with their lucrative deposit bonuses, and benefits end there. World Wide Vegas Casino ensures that not only new players receive the benefits of playing with their casino. For example, every Saturday the casino promotes a 200% Bonus on up to $1,000 in deposits. In addition, the casino hosts slot and video poker tournaments, 50% Cash Back Fridays, a Platinum Players Club, VIP Member Club, and more! When you would like to start betting with real money, you can make a deposit with various options including credit cards, cash transfers, and pre-paid credit cards. World Wide Vegas Casino processes payouts every Monday. Otherwise, you will not receive your winnings until the following week. They cannot issue credit back to those who use credit cards such as Visa or Mastercard to make deposits. Aside from Visa or Mastercard, World Wide Casino also processes payments with American Express, Discover, Eco, UseMyBank, Diners Club International, and MyPaylinQ. Casino players outside of the United States should be aware that World Wide Vegas Casino only accepts deposits in US dollars. World Wide Vegas Casino provides excellent customer service to make your online gaming experience as convenient and easy as possible. Live Support represents the best option for help. When I had a question, a customer service agent named Abe quickly attended to my questions. In addition, players can give them a call at their toll-free number or send the staff an email.